Are you a fan of food? Do you love cooking and Asian cuisine? 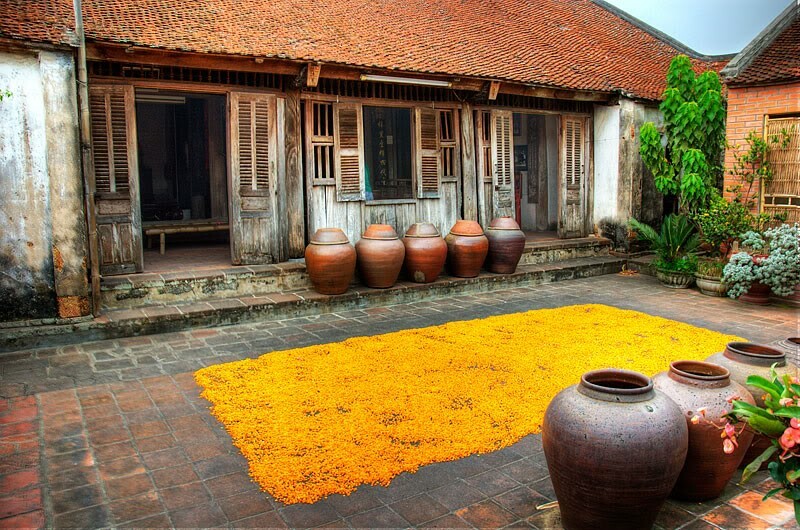 Come to Duong Lam ancient village and join our food tour to make a lot of specialty food in Duong Lam. Duong Lam is the most ancient village and the first village in Vietnam recognized as a national heritage. This village is located in Son Tay Town, about 50 km from center of Hanoi. This village is well-known for being the birthplace of two national kings. Up to now, it still preserves invaluable treasures of tangible cultural relics like ancient houses, communal houses, temples and pagodas as well as a lot of intangible cultural relics such as festivals and traditional clothes, cuisine culture etc. Duong Lam ancient village also has a diversity of ecological environment with peaceful, beautiful scenery. Visiting Duong Lam, tourists are not only have chance to visit the laterite ancient houses but also enjoy the delicious local dishes. 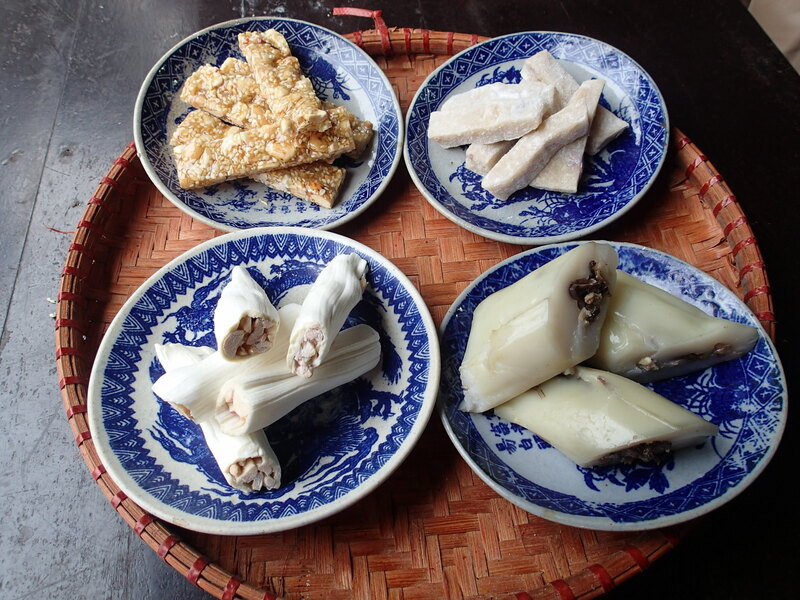 Duong lam village is also famous for food called “Che Kho”, a popular Vietnamese dessert attractive to travelers. Che Kho is made from steamed green bean. After steaming the green bean, sugar is added and stirred with green been until the mixture become soft and smooth. Few sesame seeds will make Che Kho become more delicious. Che Kho is eaten when it cool and become harder. Taster uses the knife to cut it into many small pieces. Sipping a cup of tea while eating Che Kho, you will find the soft sweet and the fragrant of the green bean blend with green tea. It’s really easy to make this kind of dessert and you can enjoy it just in one hour. There is a shop of Duong Lam sausage candy near by the village’s gate – where tourist can easily find and buy it as a local specialty. The ingredient to make sausage cake is very easy to find: malt, sugar and peanut. The process to make the cake is the most important, the candy maker need to be strong to stir the mixture. If the candy maker stirs slowly, the cake may be singed. After finishing, the cake will be rolling though glutinous rice flour to make the cover for the cake. 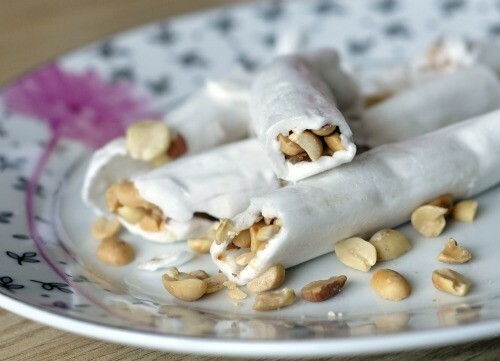 Enjoying the Sausage cake, the taster will find the nutty flavor of the peanut, the fragrant of the glutinous rice flour, and a cup of green tea will make it be come more delicious. The Mia chicken meat famous for a delicious taste: sweet and tough. The skin of Mia chicken is thin and has the bright yellow color. Villagers at Duong Lam believe that, Mia chicken is a precious dish, it symbolize for the full wealth of the family. In the past, this kind of chicken was the tribute to offer to the King. The roasted pork in Duong Lam has a very special flavor. To have good roasted pork with the stick, the chosen meat should be good quality fresh bacon, the meat have a thick skin, not to much fat. After marinating with spices, the meat is tied on a stick and roasted on hot charcoal. 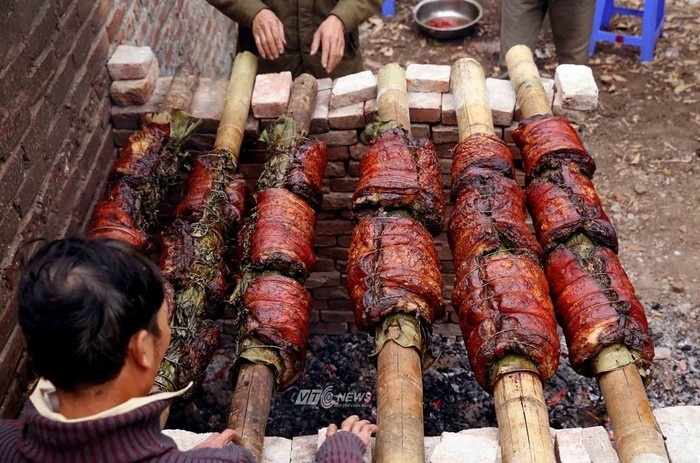 The roasted pork with the stick has the crispy of the skin and the sweet flavor of meat after marinating. One of the most typical dishes in Hanoi. 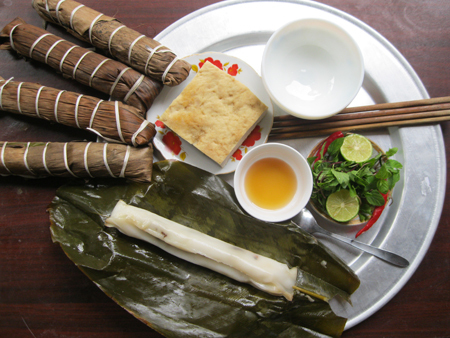 The cake is made from rice flour, wrapped in “dong” and banana leaves into a long, thin cylindrical shape and then steamed. The ingredients to make banh te are plain, non-glutinous white rice, minced pork, wood ear, onion, salt and pepper. Duong Lam is very famous for its soy sauce. Each family in Duong Lam ancient village also has few vases of soy sauce at their yard. To have a good bowl of soy sauce is very fussy. The key of the villagers is the water. The water to make soy sauce have to take from Giang well (the ancient well near by the temple of the mandarin Giang Van Minh). People said that the water from this laterite well is sweet and crystal clear. The vase of soy sauce will be dried under the sun in June – hottest time in the year. Duong Lam soy sauce always has a special flavor that nowhere else has. With a good soy sauce, Duong lam’s villagers also create many delicious dishes with this sauce: eggplant pickled with soy sauce, radish pickled with soy sauce or boiled pork pickled with soy sauce. One of the specialties in Duong Lam village is tofu which has unique flavour and taste. Come and make it your own! Someday, maybe you can own a Vietnamese tofu store in your country. One of the important steps when making tofu in Duong Lam ancient village to have its own special taste and flavour. Join our Foodie Tour at Duong Lam Ancient Village to learn how to cook them and bring it home.